The IA Summit is my favorite UX conference. You’ve got web rockstars, smaller names, plenty of sessions, and very cool ideas. Audio from each presentation get wrapped up and posted to the Boxes and Arrows podcast. This is very convenient, and removes the need for me to attend (though I’d certainly like to one of these years). I’ve been behind in my podcast listening, and last week finally got around to downloading all the Boxes and Arrows files from the 2010 IA Summit (April). The first talk I listened to was Aaron Rosenberg’s, titled ‘Using Beekeeping History to Predict the Future of UX’. Rosenberg relates anecdotes from beekeeping to iterative improvement in UX design. Beekeepers want delicious honey. That’s why they keep bees. Oddly, though, early beehives were not designed to make honey collection easy, but to make bee killing easy. That’s right—beekeepers would take the hive, submerge it to kill the bees, then scrape the honeycomb out. Quite inefficient. Subsequent iterations didn’t make honeycomb collection easier, they made bee killing easier. They were getting better at solving the wrong problem. A guy named Thomas Wildman changed everything after writing A Treatise on the Management of Bees. The object of keeping bees is undoubtedly the procuring honey and wax in the greatest plenty, and coming at them with the greatest ease. 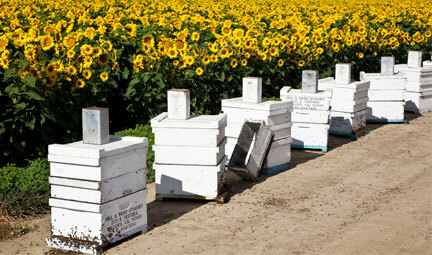 In both these respects, I think the advantages will be found on the side of my hives. Wildman’s beehive design came out of deep insights on the behavior of bees. He studied them, and through extensive observational research, came to understand them. Wildman’s beehives not only kept bees alive—they didn’t even make the bees mad when he came around to collect honey and honeycomb. Instead of iterating, Wildman innovated. As Rosenberg tells this story, he draws parallels to UX. The practice in today’s design methodology seems to be ‘prototype and iterate’. We get a best-guess up and online, then make incremental changes. What if our iterative improvement is solving the wrong problem? That’s where we need innovation. How do we move from iteration to innovation? Experimentation in UX allows us to step from iteration (qualitative design) to innovation (quantitative design). That’s powerful. Rosenberg suggests that we develop a hypothesis of what our designs are doing. Sit back and think about what our design is supposed to be doingo, and then make logical guesses about how people will interact with it. We then test that hypothesis through usability labwork, eyetracking studies, and extensive analytic analysis. Maybe our hypothesis was spot on. If so, that’s great. We can keep up the iterative change. But our hypothesis is probably wrong to some extent. Maybe we’re a little bit off. Maybe we’re totally off. We won’t know until we test. When we understand how people are really interacting with our design, we can make innovative change.